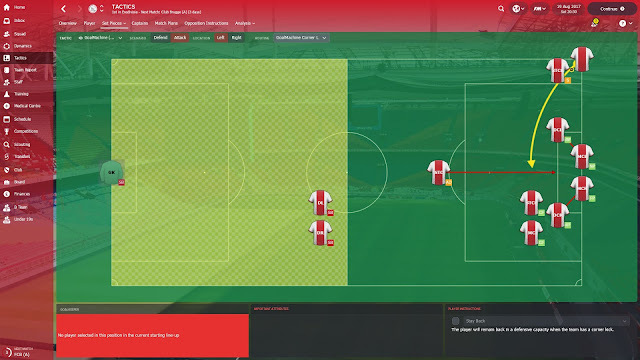 Fabulous attacking 4-3-3 Goal Machine Tactic for FM 2018 by Steam user DarkXess. 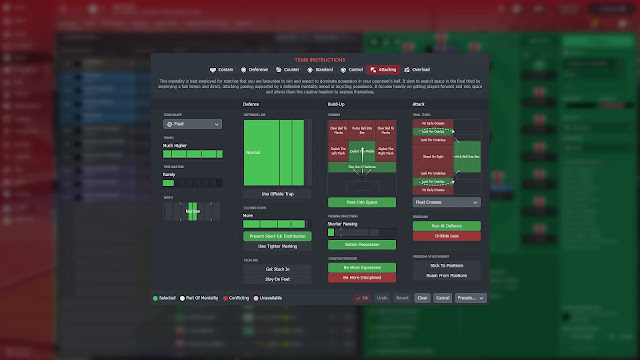 Here is an updated version of DarkXess popular Football Manager 2018 tactic 4-3-3 (GoalMachine). I have fixed and tweaked plus added some custom set pieces for the newer game version 18.3.3. The set pieces are not required, but are recommended to use, they will also get you more goals. This FM18 tactic is made purely for goals, high-possession ( based attacking ), and at the moment it's doing just that. As mentioned above, I have marked out in the Set Pieces image that MCR and MCL positions are important in taking the corner kicks. Do not forget that the team needs to get familiar with the tactic before it starts working as it should do. 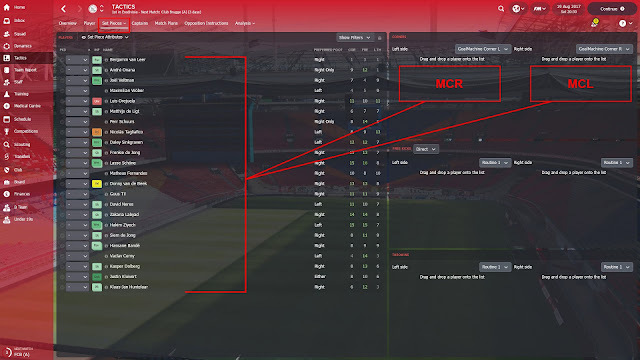 I suggest having good attacking support AMC's on the left and right of the main centre-forward/striker OR both sides being forwards/strikers as well. The fullbacks, as usual, will be important getting a lot of assists so make sure you have a good pairing on either side. The rest of the team pretty much normal. Things will get way better upon the team being more familiar with the tactic. I have the match instructions done by the assistant, same goes for the team training. Team talk is always important to be aggressive - it works, trust me. The fullbacks, left-sided midfielder and left/right sided attackers are the most important players to pick, it even works putting a decent AMR or AML on either side of the attack to support the central attacker. Push your team - aggressively encourage them during the match. My best outcome of the tactic so far position wise are LB, RB, MCL, MC, ST, (STR & STL not for goals but assists) so my suggestion is to pick a good squad for them positions. 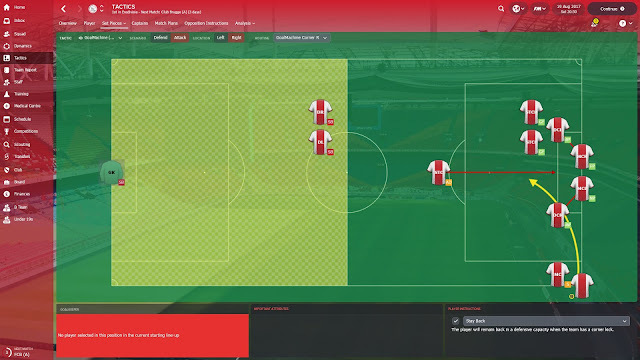 Credits for this amaizing attacking FM 2018 tactic go to Steam user DarkXess. Original post for any kind of support can be found here. 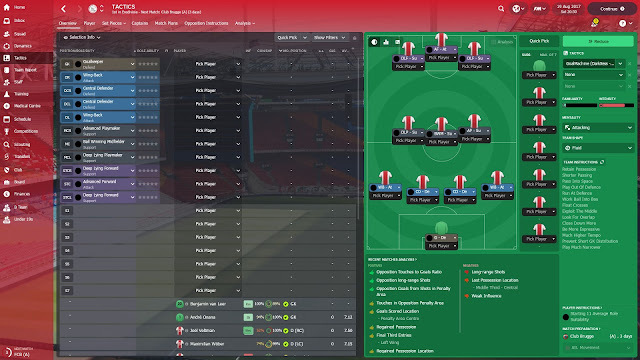 DarkXess Football Manager 2018 tactic, the attacking 4-3-3, aka the Goal Machine. Team instructions, formation, and set piece instructions included.